As what its name has indicated, the scenic fountain is mainly built in different scenery spots, such as parks, roads, streets, various buildings, rivers, lakes, oceans, tourist attractions, ect. To creat unique feelings as well as to match various scenic spots, the scenic fountation falls into different types: laminar flow, running, dry, bullet, laser, water curtain fountatins, and many other interesting fountains, like rat jump, clock, music score, maze(libyrinth) fountains, and such. Roughly speaking, the scenic fountain acts as a fresh and innovative fountain for decoration. It has beautiful apprearance and pleasant sound that goes along with its flowing water. Established in 1984, Guangzhou Water Art Fountain Irrigation Garden Co., Ltd is a professional manufacturer of scenic fountain in China. In addition to scenic fountain, we still provide customers worldwide with artificial fog fountain (mist fountain), laser fountain, waterfall rockery, sculpture fountain, floating fountain, running fountain, wall fountain, creek water feature, indoor water fountain, outdoor water fountain, direct jet nozzle, central upright fountain jet, , flower fountain jet, dandelion fountain nozzle, rotary nozzle, flat nozzle, adjustable nozzle, water sphere and hemisphere nozzle, aerated nozzle, spring nozzle, etc. We have built water features for Spring Festival Evening Gala of China, China Art Festival, and many other Chinese literature and art activities. And so far, we have set up long-term cooperation relationship with customers around the world, such as Malaysia, Brunei, Tajikistan, Saudi Arabia, UAE (United Arab Emirates), and many other countries in Central Asia and Southeast Asia. If you're interested in our scenic fountain, please contact us freely. Artificial Fog FountainThe artificial fog fountain, also called mist fountain, can built a borderland between reality and dreamland. It can be used independently in amusement parks, stages, etc. Also, it can be used in conjunction with musical fountain and program controlling fountain. 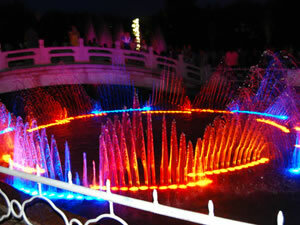 Laser FountainThe laser fountain is mainly used in public places, and it has perfect business performance. Its laser imaging system is capable of printing various patterns, words, and ads onto the water curtain, so it not only beautifies its surroundings, but also offers good advertising effect.